The Cleveland Division of Police and Community Relations Board will host a community meeting in each police district this Saturday, September 19 at 11:00 am. The purpose of these meetings is for community members and the Division of Police to discuss ways each community can address violence, prevention, and safety in their respective neighborhood. 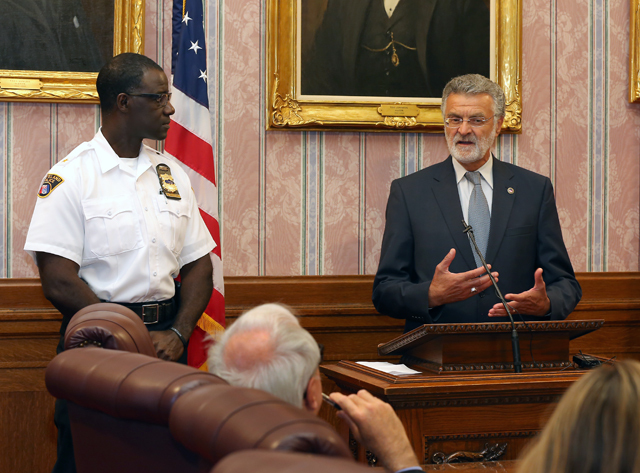 Mayor Jackson and Chief of Police Calvin Williams address gun violence in the city during a press conference. In addition to the community meetings this week, the City of Cleveland and Division of Police encourage residents to attend monthly Block Club meetings in their community beginning October 24th. For more information about the meetings listed above call (216) 664-3290.